Social Media in the sneaker world. I’m a sneakerhead. Some of you may have noticed, some of you may not have. It’s an expensive world to be in, but a passion. Social media is a big deal when it comes to shoes. To be very honest with you, I can’t go a day without some sort of interaction with my sneaker updates. With this being said, the world that I am involved in has changed throughout the years, due to the rise of social media usage. One thing that Facebook has really brought up are sneaker groups, where people have access to sales/trades of shoes. Social networking leads to actual networking, therefore creating relationships. This is an important aspect of the sneaker world because of the change in the sneaker game. You can’t get a pair of Air Jordans these days without putting in work to secure yourself a pair! One group in particular is MSX or Midwest Sneaker Xchange, which is a large sneaker exchange group, with many members (including myself) primarily from the Midwest region of the United States. They’ve held 5 different events, helping people meet up and exchange/sell sneakers, meet people and create relationships. Take a look below at one of the recaps from one of the shows they had. This is a show I actually went to in Milwaukee, WI back in February, and I can say that it was awesome! Like I said above, you need to put in some sort of work in order to even secure a pair of sneakers for yourself. 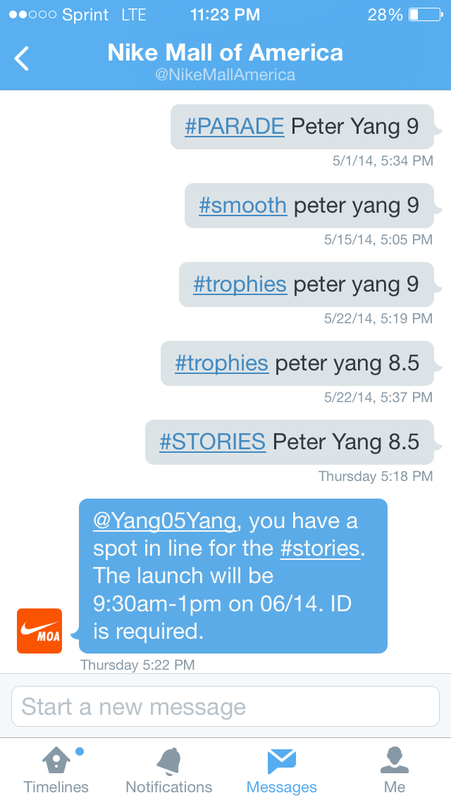 Welcome the RSVP service for retail Nike Stores, via direct messages on Twitter! To be perfectly honest with you, I never thought i’d need a Twitter account. For this sole (no pun intended) reason, I HAD to get one. Whenever a very hyped pair of shoes are going to be released, Nike usually has an RSVP service, in which your local Nike Store has to receive an RSVP from you on Twitter. Once they tweet a picture of a hashtag, you need to respond to them by sending a direct message to them with the hashtag circled in the picture, your name and size. IF they received your message, they will confirm that you have a spot in line and they will hold the shoes for you on release day. CLICK HERE for a full explanation on Nike’s website for RSVP instructions. This past weekend, I won my first ever spot in line, as you can see below. These spots aren’t easy to win (as you can see my other RSVP attempts weren’t responded to) because you have thousands of others trying to do the same thing as you! You can say I got lucky. 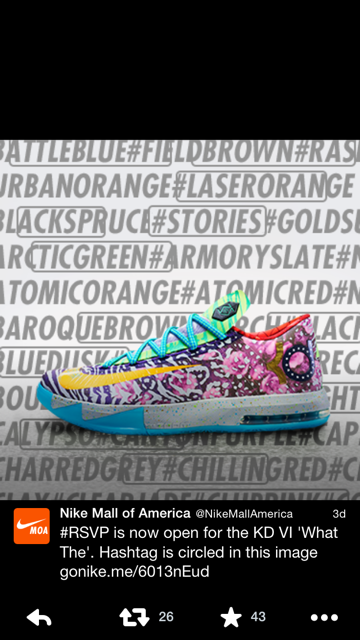 These are just a few things that happens in the sneaker world on social media. There are many notable online blogs that follow releases and news, such as NiceKicks, Kicksonfire, & Sneakernews. Obviously there are more, but those three are my favorite. Also, there are online raffles where you can buy tickets to try and win shoes, Instagram image reposts to try to win sneakers, sneaker promotion through instagram, etc. The new ways of networking and promotion are endless with this world! Beforehand, you could walk into a footlocker and buy a pair no problem. These days, you need special resources to be able to buy a pair! These social media platforms have taken over and will continue to rule this world if you ask me. Many people haven’t been exposed to these types of things and wouldn’t even think it existed! It is truly a powerhouse in the social media world and will definitely be like this for a long time. In today’s world it is important to keep children in touch with technology. Just this year, my niece and nephew brought home iPads and are expected to read and do homework on a daily basis from a screen rather than a book. They even have assignments where they have to research on the internet work on interactive calendars and assignments. These assignments are made possible because of the enhancement of the internet to Web 2.0 and introduce the interaction and collaboration that also enhance social media. In a post where a mother feels that Facebook is overtaking her daughter’s life and that she has lost all of her friends. Does she know what her child does while at school and how much they interact there? How about being on Facebook and talking to her friends through chat or messaging? Just because they are not together does not mean that she does not have friends or is not conversing with them on their Facebook walls? Social Media can positively impact a child’s mental growth. Research by Pediatrics and an article, point out that there are benefits such as collaborating on projects, staying connected with others, and contributing to charity work that is done by children and teenagers that use social media. I understand that some mothers feel that their children spend far too much time on social media such as Facebook or Twitter but when the World Wide Web introduced version 2.0, it expanded the market to include far more interaction between users of any age. Instead of placing blame that Facebook is ruining a childs life, embrace the fact that this is part of a childs development in today’s world. With email, blogs, Facebook, and all of the other types of online communication possible, children should be able to participate. I am not saying that it needs to overtake their lives or that children should be vulnerable to information that is not age appropriate, but it is enviable that children will need to use social media. There is even a show on television show on the Disney network, entitled Dog with a Blog, where a family dog writes daily about family values in his own blog following each episode. Not all social media is bad and because someone uses social media it does not mean that their lives are ruined. Instead, if this mother could understand the benefits it might enlighten her …. Ironically, this mother turned to the web to post her concerns, why shouldn’t her own daughter? Why is Everybody Worried About Their Privacy When They’re All on Facebook? So, I admit it… I am not on Facebook. I have no desire to be on Facebook, and I am aware that I may be missing out on a ton of cool things, but I just can’t do it. That’s just the way it is. I am one of only about a handful of people that I know that doesn’t have a Facebook account. Anytime I meet another person who is in my same position, there is usually a high five, a head nod, or we both immediately shout out an excited list of reasons why we choose not to be on Facebook. It’s a special bond, like we’re part of our own network that will probably not hear from each other again for several months… or ever. Now don’t get me wrong. I have nothing against Facebook or people who are on it. It has done amazing things for our world. It has connected millions of people across the globe in a way that was not possible before. Its easier to stay in touch with old friends or relatives. Musicians have used it as a way to collaborate with other artist or reach out to a larger fan-base. It has been used as a tool to organize the masses and spread social awareness of many issues. Businesses and non-profit organizations are able to connect with their audiences and listen to what they are asking for. Facebook really is amazing. So why am I resisting it so much? Well, the short answer that I give people is… privacy. I don’t like Facebook because I feel like people expose too much of their lives on it. I know it all depends on how you use social media of any kind, but think about what the average person has on their Facebook page. 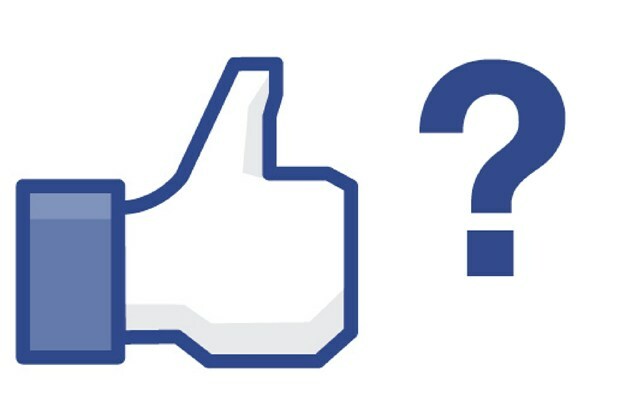 How well can you get to know someone by their Facebook page? Look at your Facebook page, do you have any of these on them? I know that posting any of these things onto Facebook is optional. But if you don’t post pictures or have conversations, what fun is it? And YES, I know that you can set privacy settings so your grandma doesn’t see the pictures of you at Mardi Gras from last year, but I am still amazed that so many people are willing to put so much of their life online. Even if a person “doesn’t have anything to hide”, does that mean that you need to expose yourself like this? Again, I have nothing against Facebook or its users. Most of the people I know are on it and are constantly trying to convince me to get on it. As of June 2013, Facebook claims to have 1.15 billion users, so it must be pretty cool. But for me, especially during a time where the NSA has become a household name and our government is being accused of spying on its own people and people from around the world, I still think I rather not have one. The idea Phonebloks presents is a great alternative concept for a piece of technology almost everyone in the western world makes use of on a daily basis. It’s true that a vast majority of our technologies aren’t made to last. Is this more a problem of cost or simply the perpetual motion of the ever advancing technological field? How I see it, any piece of technology is outdated after two years anyways. If you use it for more than Facebook and email that is. How would it be any different with this phone? The components would be constantly become outdated, meaning people would be in constant a “keeping up with the Jones’s” mentality. Ultimately this would cause just as much, if not more electronic waste overtime. Because people always want the newest toy. In theory this would eliminate the competitive drive companies have to best one another. Now is that truly a good thing, or would it simply create yet another monopoly holding conglomerate. In the video the idea is present that different companies would make their own specific bloks for public purchase, but in the world of business there is always the giants who run the market. For example– would people simply buy certain components because they contain the Apple logo because they’re considered reputable now? Lastly how would operating systems work/be doled out, and how would actually get control over the “app market”? Though Phonebloks has a good idea/concept I don’t feel it would ever work in reality, nor with the current way capitalism and the western world choose to conduct business. Just like any other campaign they blow the positives out of proportions, and skirt the negatives.